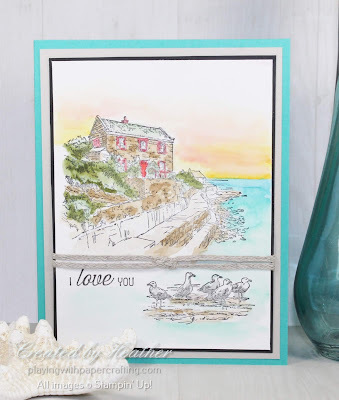 I love the images in the By the Bay stamp set which is one of the Sale-A-Bration rewards from the Sale-A-Bration Brochure, but it's one of those sets which doesn't give you a ton of options for using because it needs to be coloured in some way to be really effective. You could use your Stamparatus and your Stampin' Write markers to colour in different parts of your stamp and repeatedly stamp it as one option, or Stampin' Blends, but I decided to watercolour mine and use it as a masculine Valentine card with the addition of an I Love You from the Flourishing Phrases stamp set. I taped a piece of Shimmery White cardstock to a spare Stamparatus plate (which is perfect for the purpose because it's so easy to clean up after, it has a grid on it to help you tape evenly for a border, and it's perfectly smooth and flat.) 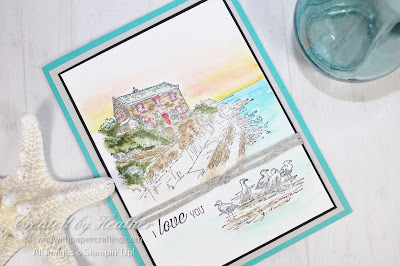 I had already stamped the two images from the By the Bay stamp set and the sentiment from the Flourishing Phrases stamp set in our retired Basic Black Archival ink, which I have always loved and will continue to use until I run out. It's a permanent non-water based ink so it works well for watercolouring. 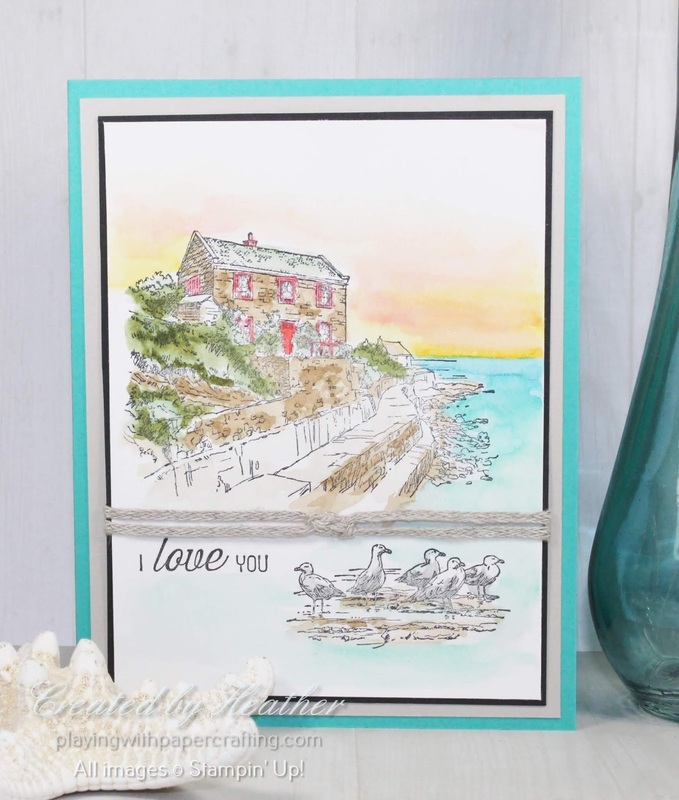 I used Sahara Sand, Soft Suede, Mint Macaron and Mossy Meadow for the landscape and the same colours for the house, with the addition of a pop of Poppy Parade for the windows and doors. 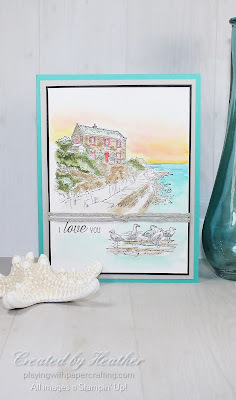 In retrospect, I wish I had just left those a neutral, because it's very hard to get those accurate using an Aqua Painter, but I wanted a weathered beach house that someone had tried to brighten up a bit with some red paint! I loved painting the background the best. 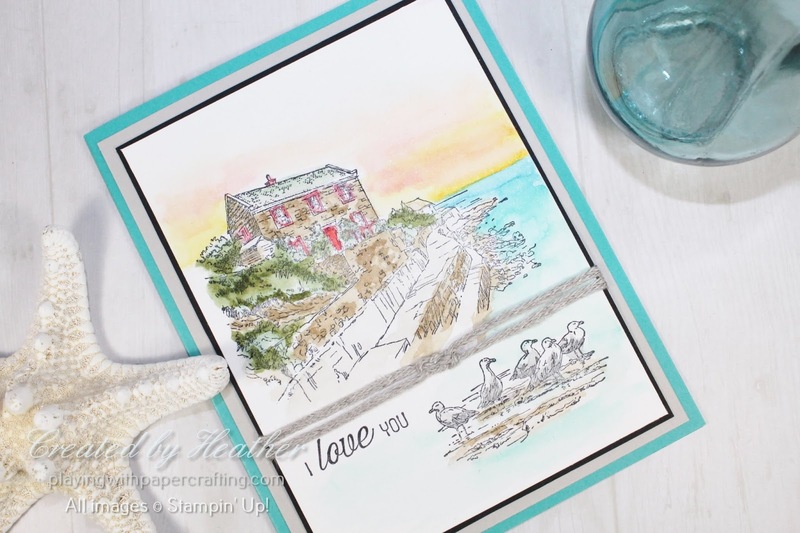 With a tape to separate the horizon, I started with Mango Melody layered with Flirty Flamingo, Pool Party and a little Highland Heather for the sunrise sky. The ocean bay waters started with Pacific Point at the Horizon and progressed to Bermuda Bay, Coastal Cabana and a little Pool Party at the bottom. 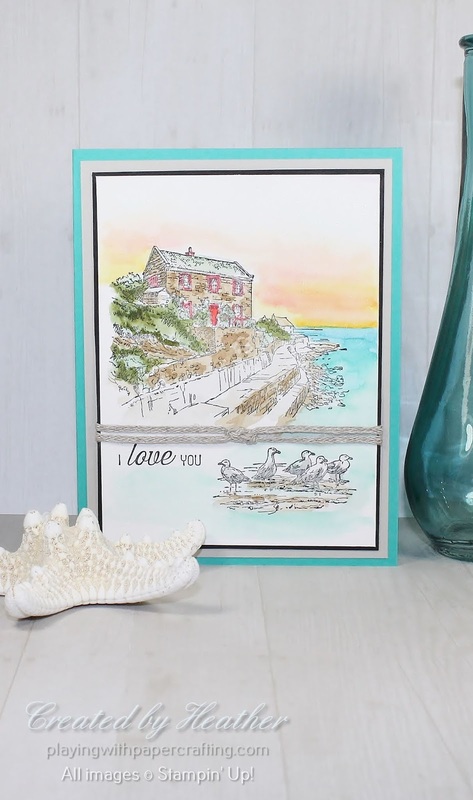 I used the Braided Linen Trim to tie a Sailor's Knot and add it to the picture between the cottage scene and the sentiment and the gulls on the beach below it. The Refugee Care Collective at Emmanuel Church in West Kelowna is hosting a Two Day Crafting Retreat /Crop in our bright, spacious lobby from Friday, March 8 at 9 am to Saturday, March 9 at 5 pm. The $90 fee will get you 2 lunches and 1 dinner prepared in our kitchen, lots of natural light, room for your equipment, a goody bag, door prizes, make and takes, challenges, and use of my equipment and stamp collection. All proceeds after costs, and all profits from any orders taken through Stampin' Up! will be donated to the Refugee Resettlement Fund at Emmanuel Church, as we raise the money to support a Syrian Refugee family consisting of a widowed mom with six kids. Come out and have a great time crafting, but also support a wonderful cause and do something to help relieve some of the suffering in our world. All meals will have vegetarian and gluten free options and will be nut-free. Let us know if you have any other actual anaphylaxis reactions. There is no planned accommodation but the Holiday Inn is right next door. The registration deadline will be Saturday, February 23, and registration forms will be send via facebook message to anyone who indicates they are coming. They can also be sent via email to anyone who is not on facebook as long as I have the email address. Payment options are included on the form. Registration will not be considered final until payment is received. You can complete the form online and click on "Submit" and I will receive your registration. There will be a $75 option for those who, due to work, will miss the lunch on Friday. I hope you can attend if you live near the area.